I’m skipping Top Ten Tuesday this week because I finally finished a couple books to review! Also, the topic is film adaptations, and I’m not really on the up-and-up with that sort of stuff too well. 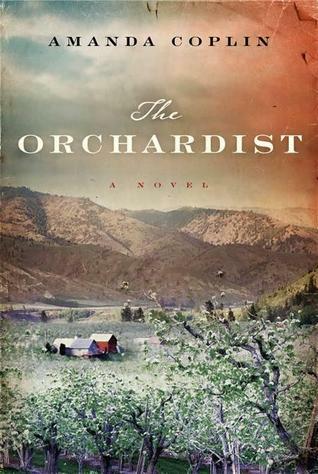 The Orchardist by Amanda Coplin is set in the Pacific Northwest around the turn of the twentieth century. Talmadge, the proprietor of a fruit orchard in central Washington state, has lived a solitary life for decades after his mother died and sister mysteriously disappeared. One day, two runaway teenage girls steal some of his fruit and catch his attention. Talmadge feeds the girls and gives them shelter, later learning about their troubled past and dealing with the consequences of taking them under his wing. Their lives become entwined in this quiet Western tale of family, loyalty, and love. It took me longer than I expected to read The Orchardist. It’s beautifully written, with careful prose and descriptive imagery of the setting. I enjoyed inhabiting the world of the orchard and untamed Northwest. It was all a very romanticized sort of feeling while reading. The first half of the book is wonderful and a definite page turner… but then I don’t know. Maybe it reaches the climax too soon? Maybe it’s a few dozen pages too long? The second half fell flat for me. There are lots of pauses in conversation, gazing off into the distance, stopping everything and staring in disbelief at a question… interruptions like that in the action exasperated me. I also had trouble identifying with the main characters in the second half. Talmadge and the girls just seemed so… two dimensional, or something. I felt more comfortable with Caroline Middey, Talmadge’s old friend who came around the orchard once in a while to help with the girls. This was my first experience reading an ebook. I think it may have been the first book I downloaded to my iPad mini… not sure—I got a few at the same time. I started it on my trip to Aspen almost three weeks ago, thinking that it would be better than lugging around a paper book and for the most part that was true—I do like that aspect of ebooks over paper books while traveling. But after the first 150 pages or so of this one, I felt less and less compelled to open it up and read. Once I did, it was lovely, but this wasn’t one of those books that I can’t stop thinking about all day, can’t wait to get home to read all night, etc. Coplin’s writing, though, and the premise of The Orchardist (her debut book) did pique my interest enough to see what she may do next. Read from June 20 to July 7, 2013. This entry was posted in books and tagged drama, family, female adolescence, fiction, friendship, historical fiction, literature, love by kristin @ my little heart melodies. Bookmark the permalink. Yea for ebooks! I also love them for travelling. Otherwise I pack way to many physical books 🙂 I’m sorry to hear that the ending wasn’t as good as the beginning. It’s just not as fun to read when you have to make yourself do it. Yeah. I was bummed. The story started off so great! And I really loved the writing… at first I thought maybe it was the ebook aspect that was bogging me down (like… was I less interested in looking at a screen for reading now that I was back home after my trip? ), but thinking about it later, maybe the book was just too long. That said, I would still recommend it if you like historical fiction! I just read an absolutely glowing review of this one so I’m glad to see your tempered opinion. I find that books with this kind of depth–the writing, the characters, the themes–aren’t always well-suited for roadtrips. too bad that the second half was a let-down! I agree, it probably wasn’t the best for a trip. More attention needs to be paid to this slower-paced read, and that’s tough when you’re on the road. It was still lovely and I do recommend it if you like historical fiction, especially based in the wild west!